The following article is a summary of a recent talk by Upsolver’s CTO Yoni Iny. You can check out the slides below or keep reading for the full version. Let’s start with an (extremely) brief explanation of how Apache Kafka works. Kafka provides a robust, reliable and highly scalable solution for processing and queueing streaming data, and is probably the most common building block used in streaming architectures. But what do you do once you have data in Kafka, and how do you get it into a form that developers and data analysts can actually work with? In the next part of this article, we’ll explain why the answer to that question, in most cases, is to build a data lake. Why not read directly from Kafka? A lot of organizations look at the neatly partitioned data going into their Kafka clusters and are tempted to just read that data directly. While this might sound like an easy fix with minimal data plumbing, it also has major drawbacks that all stem from the fact that Kafka is a system that is highly optimized for writing and reading fresh data. Unlimited writes: Kafka stores events on one large file on disk, and that file is appended sequentially as new events are processed. This system enables it to achieve truly incredible feats such as completing two million writes per second on three cheap machines. High reliability: Even without too much tweaking, Kafka is highly fault-tolerant and writes just work - you don’t need to worry about losing relevant events. Strong ordering within a partition: Data is ordered sequentially; if two consumers read the same partition, they will both read the data in the same order. This means that multiple, unrelated consumers will see the same ‘reality’ - which can be extremely important in some cases (e.g. when assigning workloads). Exactly-once writing: Kafka 0.11 introduced exactly-once writing, which is very handy as a means of reducing efforts on the consumer side. Retention is 10X-100X more expensive than when using cloud storage: Storing historical data on Kafka clusters can quickly drain your IT budget. Kafka stores multiple copies of each message on expensive hard drives connected to servers. Both of these factors contribute to at least 10x the bottom line compared to storing the data on a data lake such as Amazon S3. Risk to production environments: Reading from Kafka in production is not great: every additional consumer drains resources and slows performance, while reading “cold” data will likely cause cache misses. Waste of compute resources: Kafka consumers read an entire record to access a specific field, whereas columnar storage on a data lake (e.g. Apache Parquet) will allow you to directly access specific fields. 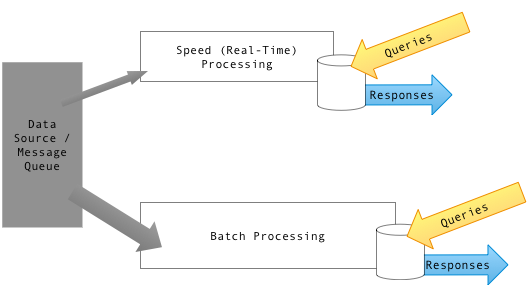 Data quality effort per consumer: Each Kafka consumer works in a vacuum, which means data governance is an issue that needs to be multiplied by the amount of consumers - which in turn means repetitive deduplication, schema management, and monitoring processes; a data lake allows you to unify these operations on a single repository. Leverage cheap storage on S3, allowing you to significantly increase retention without paying through the nose for storage. Introduce new use cases without worrying about Kafka performance and stability: a data lake enables flexibility to introduce new consumers and applications, without slowing down your production environment. Ensure data quality and governance by working on a single repository rather than individual topics. You might have noticed a “Real-time Consumers” block in the diagram above, although we recommended reading data from a data lake and not directly Kafka. What’s going on?! Have we been lying to you this entire time? There are a lot of best practices you need to follow when creating your data lake, on S3 or elsewhere. You can see a quick summary of them in the last few slides above, and we’ll be covering them more in-depth in a future article. If you’re still not sure what a data lake even is, check out our Guide to Data Lakes and Data Lake Platforms.